The new head of South Africa's ruling ANC party is attempting to shift political power away from President Jacob Zuma - but he must move carefully to avoid triggering a backlash among Zuma's supporters and destabilizing South Africa's government, according to analysts. Cyril Ramaphosa was elected head of the ANC in December, replacing Zuma. The change followed years of corruption allegations against Zuma and accusations that Zuma allowed the powerful Gupta family to have undue influence in his administration, including the choosing of certain ministers. On January 8, Ramaphosa laid out a vision for the ANC that focuses on implementing reforms, improving the party's accountability and eliminating the "state capture" that critics said happened under Zuma's watch. On the same day, Zuma announced the creation of a commission of inquiry into the "state capture" allegations. “Last December, the new National Executive Committee (NEC) affirmed the longstanding policy that the ANC, not the state president, is the center of power, meaning Zuma must take instructions from Ramaphosa,” Nantulya recently told VOA Afrique. Ramaphosa is clearly broadening his support on the basis of his anti-corruption program, says Bart Luirink, a former correspondent for Dutch media in Johannesburg. He told VOA that Zuma may have to resign. “The appointment of the Commission of Inquiry may have bought Zuma some time, but chances of him completing his presidential term in mid-2019 look increasingly bleak” he said. Ramaphosa appears to be attempting to isolate Zuma, setting him up to eventually resign, Luirink said. 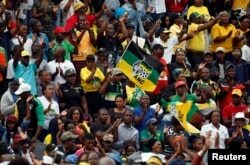 FILE - Supporters of the ANC wave a flag during the party's 106th anniversary celebrations, in East London, South Africa, Jan. 13, 2018. Analysts say Cyril Ramaphosa, in his efforts to sideline Jacob Zuma, must be careful not to wreak too much dissension in the party ahead of next year's general elections. The two centers of power, with Ramaphosa as party leader, and Zuma as state president, have raised concerns that crucial government operations could be paralyzed and the agenda of renewal and accountability spelled out in the January 8 statement could be stymied. According to the polls, Zuma is widely unpopular. In September, a poll of South Africans in metropolitan areas found that only 18 percent feel Zuma is doing a good job. However, the president still has support of key players in the government and private business. Ramaphosa also must be careful not to wreak too much dissension in the party ahead of next year's general elections. The ANC has held national power since the end of apartheid in 1994, but its share of support has slipped in recent polls and the opposition Democratic Alliance now controls of the country's major cities. Not all of South Africa's institutions have been "captured" under Zuma, adds Nantulya. “The institutions that were either co-opted or severely eroded were in the criminal justice system, parts of the police and intelligence, and state-owned enterprises. The judiciary and the institutions supporting democracy, such as the Public Protector, remained resilient," he said. “The balance of power is still evolving but Ramaphosa has clearly stamped his authority and will continue to work assiduously to turn things around. It has become increasingly clear that the ANC’s electoral fortunes, perhaps even its survival, will largely depend on how well it makes a clean break from the negative trajectory of corruption, influence peddling, and state capture,” Nantulya said.